Generating organic traffic with high ranking search engine results can be an incredibly difficult marketing technique to master. The advanced algorithms that govern search engine placements on platforms such as Google and Baidu are updated very frequently in an effort to bring users more relevant results. These frequent updates pose a tough challenge for marketers. Just when they think they have mastered their latest ad campaign and found the right keywords, the algorithms are changed and it’s back to the drawing board. Search engine optimization can be very complicated, time consuming, and even frustrating at times. But, thankfully there are tools that have been developed to aid online marketers with their SEO efforts. 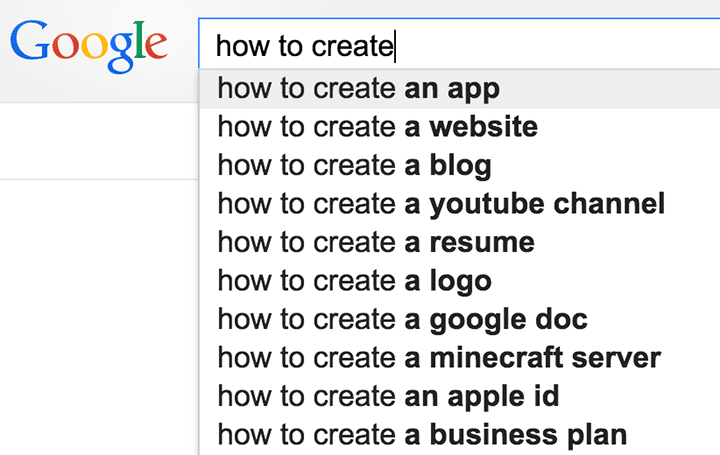 Some of the most popular tools are keyword research and planning tools. These keyword research tools help users see which keywords and trending, and also which keywords their competitors are using. To market your page like a professional, read this guide to find out the absolute ten best keyword analysis and research tools available. If you take the time to read this guide, and follow the tips found inside, then your ads will be on the top of users search engine results pages in no time! Keyword research tools are innovative tools that have been created to help marketers with their SEO marketing campaigns. These tools can perform a wide number of tasks such as keyword generation and tracking. These tools give marketers helpful insight and allow more time to focus on other important aspects of their digital marketing strategies. Some of these tools are better than others, and they each have their own pros and cons that we’ll evaluate in this guide. Ultimately, it’s up to the user to determine which features are the most important to fit their own needs. In order to determine the best one for you, try out many of the free trials that are offered. In general, when marketers are evaluating which keyword research tools to use there are several factors to consider such as price, user experience, and ease of use. Some other considerations to keep in mind are customer service and support. This guide will help ensure that you select the best keyword research tools for your own needs and will discuss many of these important factors. The best way to learn how to effectively use these tools is with first-hand experience. Marketers should try multiple tools out to get a feel for the most effective tool for their goals. The guide below is a list of the top ten best keyword research tools of 2018 that are guaranteed to boost your pages relevance and authority. Ahrefs was designed to help marketers learn what the competition is doing for their marketing campaigns. This tool allows users to research their competitors and see exactly which keywords are trending inside your target niche. Ahrefs is an all-in-one solution that is also an industry leading SEO toolkit, and Ahrefs has landed the number one spot on our list of keyword research tools. Ahrefs has popular features such as keyword generators, backlink and broken link checkers, as well as advanced analytics and reporting. This is another excellent one-stop-shop for SEO marketing needs, and it has earned our number two spot of the ten best SEO tools available on the market. Ahrefs has advanced web-crawling and indexing capabilities and is known by many as the industry’s most advanced backlink checking tool available. It has a fairly simple user interface and it lacks some of the bells and whistles of other tools on the market, so it failed to take the top spot, but it is still an excellent option for marketers looking to grow their online presence. 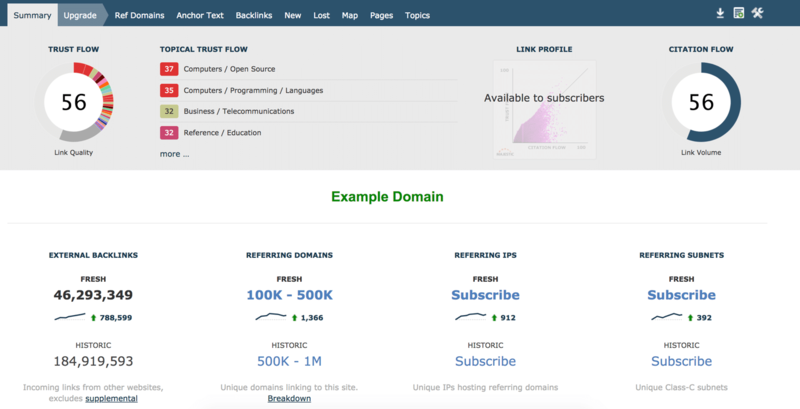 This popular tool is an all-in-one and convenient option that allows users to perform keyword searches, domain crawls, and even domain comparisons. One of the most widely used features is the keyword explorer tool. This tool operates similar to that of MozPro and allows users to perform keyword research to help their pages rank higher. 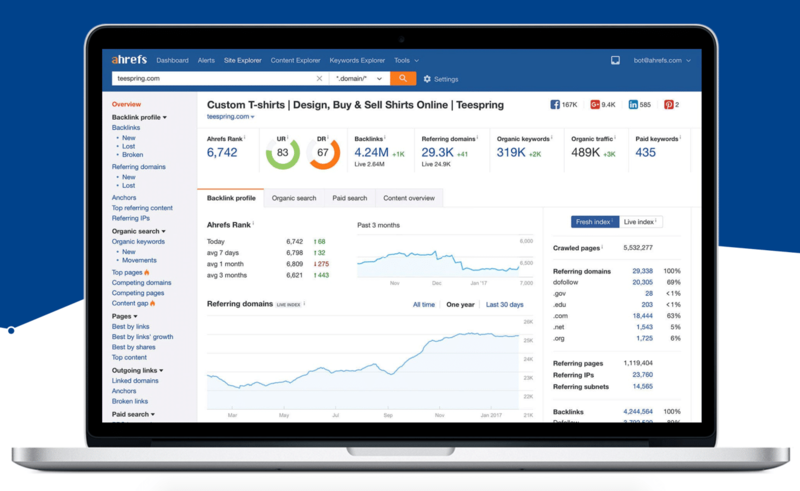 Ahrefs provides its users with interactive charts that contain all of the important keyword research metrics such as cost per click, and keyword difficulty. Another helpful feature that Ahrefs SEO tool provides users with is the broken link checker. This helpful tools allows users to find and eliminate broken backlinks. This broken link checker will give the user new backlinks by allowing them to fix the dead links, and keep your website running smoothly. Fixing inbound and outbound links is essential for SEO users to turn relevant websites into high quality backlinks. One of the negative aspects of Ahrefs is that it is an expensive option for SEO marketers. Operating on a similar subscription service as our top choice, MozPro, this tool can be expensive for users who don’t have a large budget to allocate for SEO marketing campaigns. It is more cost effective when users purchase annual plans because they receive a twenty percent discount, however monthly plans are also available. The individual plans are about $1000 annually, and the advanced and agency plans for businesses and agencies are roughly four to ten thousand dollars per year. These costs can seem incredibly expensive, but successful SEO marketing techniques can lead to large ROI. Ahrefs is a great option for marketers who want a one size fits all solution for their SEO needs. This powerful tool provides users with popular features such as keyword generation and tracking, along with advanced auditing features such as backlink and broken link checking. The price tag is pretty steep, and the user interface is a little more complicated and cluttered than that of our top choice MozPro. But, Ahrefs is still an excellent choice and is trusted by hundreds of thousands of users across the globe. Some of Ahrefs largest clients include tech giants such as Facebook, Adobe, and Netflix just to mention a few. 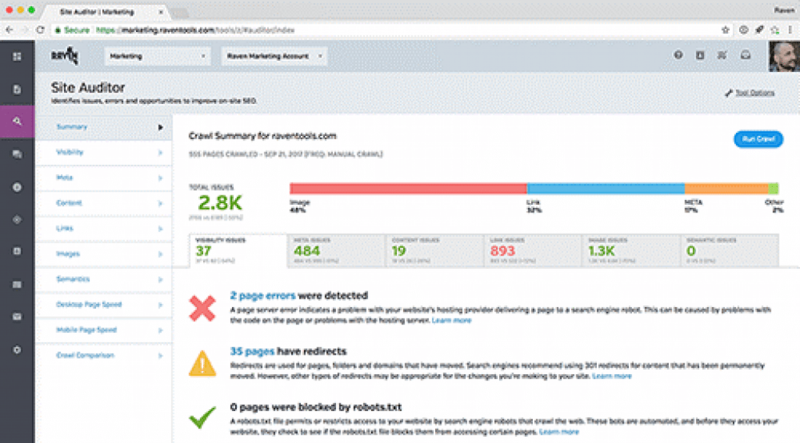 Coming in at number two on our list of the top ten best SEO tools is SEMRush. This is a wonderful SEO toolkit for freelancers, in house marketers, and even large digital media agencies. This all-in-one SEO marketing tool was created for large scale SEO users who need to run thousands of reports per day on their various sites and keywords. SEMRush boasts advanced capabilities that includes historical data, and location-based traffic analytics. Along with an easy to read dashboard and user interface SEMrush is an excellent option to take your page to the top of users search engine result pages. SEMRush is an excellent resource for marketers who need help growing their organic online traffic. One of the most popular and widely used features offered by SEMrush is the keyword ranking feature. This is a great tool that allows users to enter in their webpage and then check out that pages rank for specific keywords. This is a great way for users to see their keyword positions, and they can determine the best keywords that need to be incorporated into their latest marketing campaigns. Another useful feature is the analytical data on keyword volume. The volume metric will show marketers exactly how many people are searching for that keyword. This can help with Google AdWords bidding strategies and can be essential for SEO marketers to master in order to succeed online. The site auditing features and web page crawlers that SEMrush offers are top notch and highly effective for online marketers. These tools are utilized by large tech industry giants such as eBay, HP, and BNP Paribas. This all-in-one marketing toolkit provides its users with ideas for gaining more organic traffic with their backlink auditing and analytics. 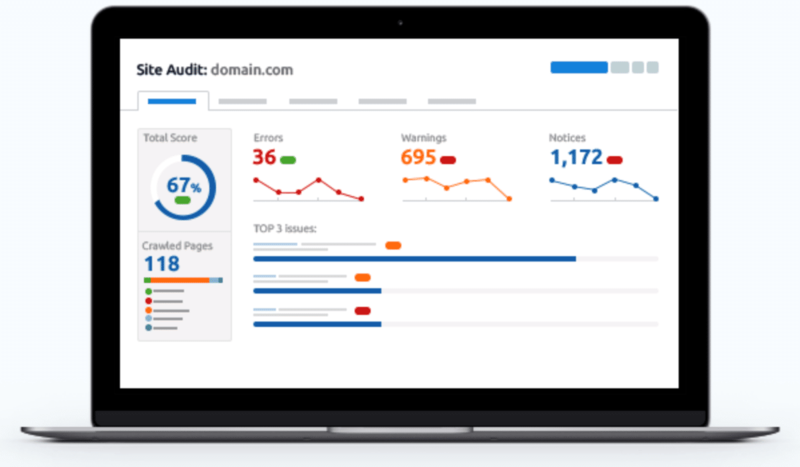 These features allow users to see their successful backlinks, their broken links, as well as other issues that may be bringing their overall score down. When users are able to see audit their link building strategies to create more successful and relevant links, they will see their pages skyrocket to the top of the search engine platform results. SEMrush has a very similar pricing structure to the other top contenders on our list. This toolkit can be very expensive, especially for larger enterprise users with large volumetric search needs. Thankfully, there is a free trial that users can use for seven days to get first-hand experience with the software and see if it will work to fill their needs. It’s best to get this hands-on trial to see if you like the dashboard and the reporting features that SEMRush offers. The tool is cheaper when an annual subscription is purchased, however monthly plans are available. There are four levels of different subscriptions and their features vary with each plan. Freelancers and small marketing teams should be able to get by using the pro plan which is about $1000 annually. Larger teams who need to run more reports each day should look at either the Guru, or Business plans which are about $2000 and $4000 annually. Although these prices are expensive, the product you are getting is very high-quality. This toolkit is right on-par with our other selections for all-in-one SEO solutions and is a great option for users to consider. To succeed in today’s current online landscape, marketers need to ensure that their webpages obtain high placement on various search engine results pages. These unpaid, algorithm driven results are difficult to master, and MozPro has created an all-in-one solution to address user’s SEO needs. 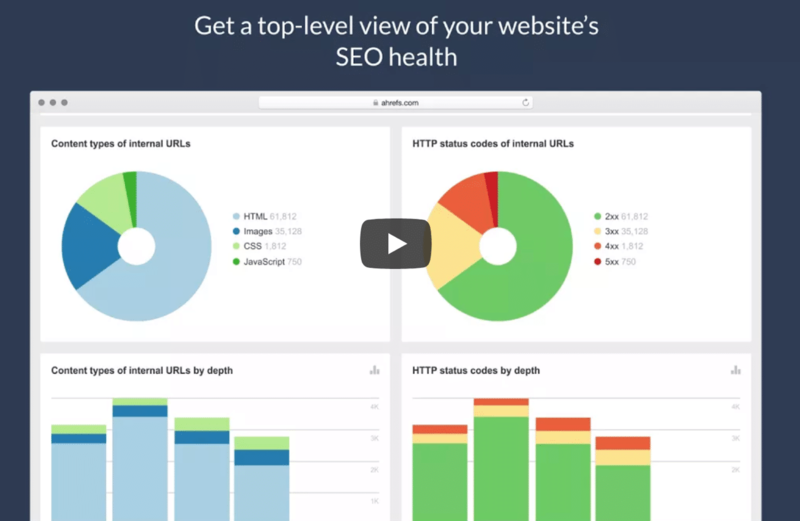 In order to ensure high quality organic online traffic, MozPro has created a professional toolkit for their customers SEO marketing campaigns that does everything from keyword research and planning, analytics, and link building. This paid service has everything a user needs to succeed in the demanding online world and thrive with their SEO marketing campaigns. 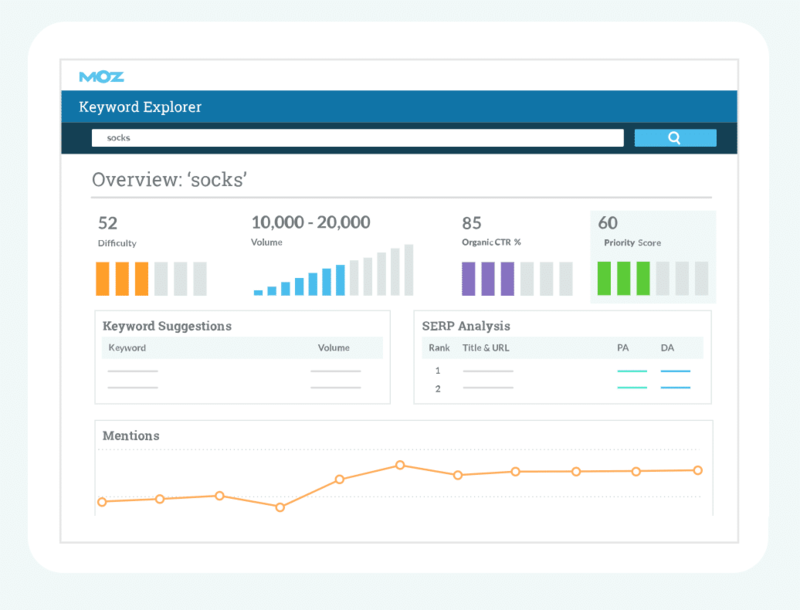 One of MozPro most popular features is the Keyword Explorer Tool. This tool can help marketers determine which of their products or services are being searched for. This popular feature shows users which keywords are being used, and helps users strategically alter their target keywords to meet current trends. Another important feature that MozPro offers users is the link explorer. The link explorer is a great option for marketers who need help with their link building and backlink auditing. In order for a page to pop up at the top of users search results, the page needs to have lots of external publishers linking to it. Tracking this type of data is incredibly important when trying to perform SEO efforts for your latest marketing campaigns. One of the most important statistics for marketers to keep in mind is their sites domain authority. This number ranks on a scale from 0-100 (with 100 being the best) and tells users essentially how well their domain will perform in a user’s search query. This estimate shows users if their site is optimized or if it needs work. Along with other essential data such as the number of linking domains and inbound links, the link explorer is a great SEO tool to use. One of the downsides to MozPro is the steep price tag. Depending on your needs, MozPro offers monthly or yearly payments. It’s cheaper to buy an annual subscription plan, but the standard plan is fairly expensive and priced at an annual price of $950. The standard plan is fine for personal users and small-time marketers, but larger agencies and enterprise users will need to consider either the Large, or Premium subscriptions plans. These plans offer amazing features however their price ranges from roughly $3,000 to $10,000 so it can be a serious investment. If you are looking for an SEO tool that has a little bit of everything, then MozPro is the best solution to fit your needs. This industry leading service is able to provide its customers with keyword research and planning tools through their Keyword Explorer Feature, and they also help with link building and backlink auditing thanks to their popular Link Explorer. One of my personal favorite features of MozPro is the clean, and easy to operate dashboards. 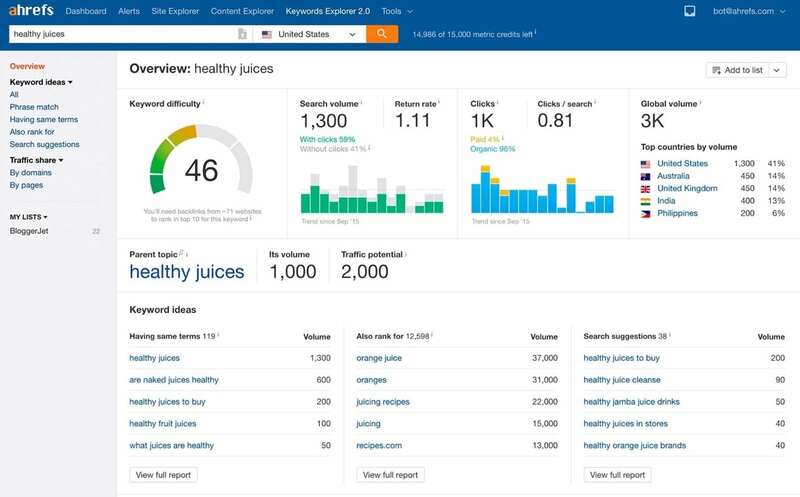 These simple and easy to understand dashboards are great for marketers who are just getting started with SEO marketing. But, MozPro also has the advanced analytical information that will satisfy even expert SEO users. Because of the convenience of having all of the features in one streamlined toolkit, MozPro has earned the top spot and has been ranked our number one SEO tool. Keep in mind though, MozPro and its excellent services don’t come cheap. This is one of the most expensive SEO tools available on the market, but if your budget can afford it, then I highly recommend using MozPro. The number one SEO keyword research tool for longtail keyword tracking and generation is certainly LongTail Pro. 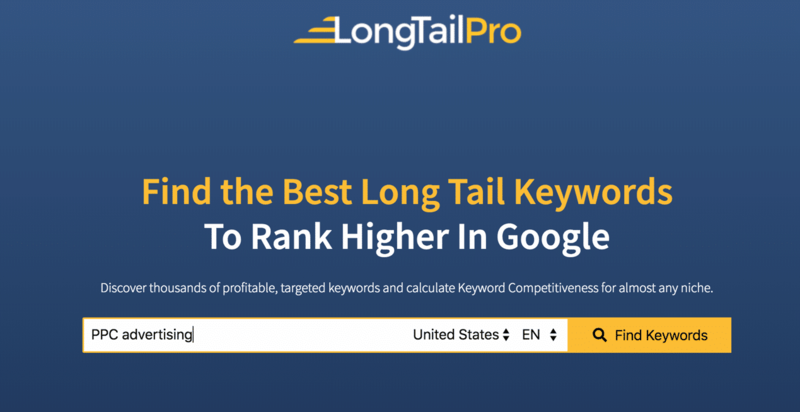 Longtail Pro is the best long tail keyword rank tracker available for SEO marketers. This allows users to rank higher on google and generate more organic search engine traffic. 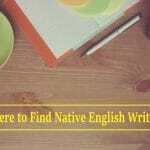 This service tries to pair the most profitable keywords for each marketer’s niche audience. One of the most popular features of LongTail Pro is the competition analysis feature. 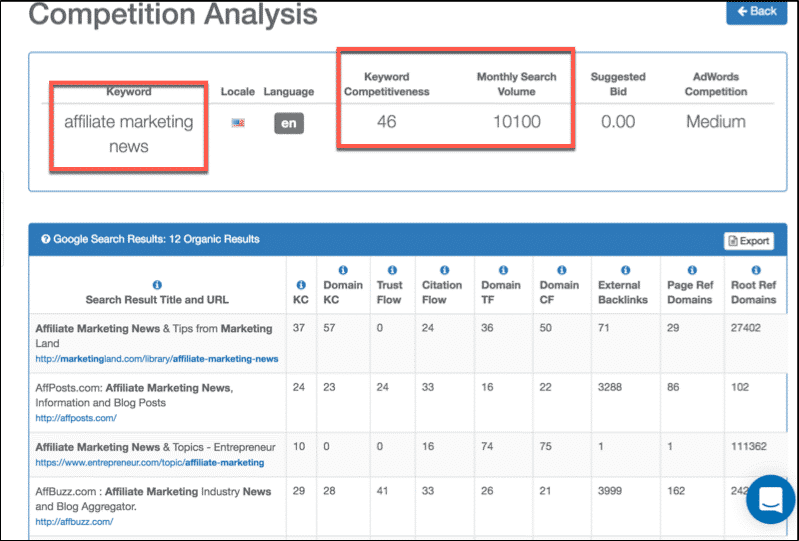 This advanced keyword feature allows users to type in a keyword and track its competitiveness, monthly search volume, and other useful metrics such as suggested bid, and AdWords competition level. The reason that LongTail Pro comes in at such a high spot on our top ten list is due to its cost-effective pricing model. The service is only $297 for a year subscription. This is very cost effective and a lot more economical than some of the competitor’s options. Because though this service is limited in its overall breadth of features, it is not an all-in-one SEO solution. Perform up to 10,000 keyword searches per month and elevate your latest campaigns organic search results to the next level! 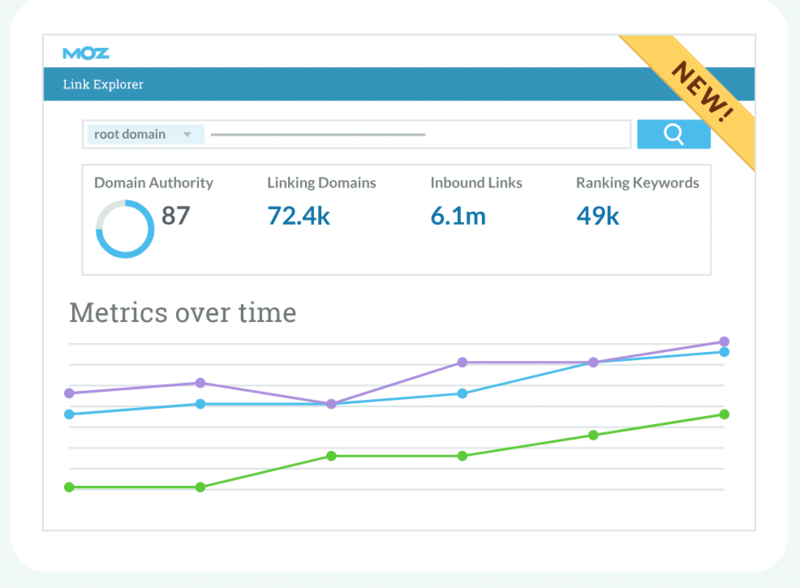 The fifth best overall SEO tool that we reviewed is Keyword Tool. This tool is different than the other top contenders on our list, because unlike those all-in-one tools, this software is just for keyword research and tracking. Although it’s not a complete SEO marketing solution, this keyword planning tool boasts advanced features such as the ability to track keywords on specific platforms like Google, YouTube, and Amazon. Keyword Tool has many free features, but also offers a paid Pro service subscription for users with more intensive needs. Keyword tool is able to generate such accurate and relevant keywords because it takes advantage of the Google Autocomplete software. This autocomplete software selects appropriate keywords based on numerous different factors. The tool does the work for you, and takes the complicated guesswork out of SEO keyword generation. The powerful free version of Keyword Tool is capable of generating up to 750 targeted keywords in seconds for users. There is a free option of Keyword Tool that is available to the public, and there is also a pro subscription model which is paid. The free option should be enough for most small-time freelance marketers and entrepreneurs. But, those users and digital marketing firms with larger needs will most likely need the power behind the pro subscription models. There are three available selections for the pro model and they each vary in pricing and available options. The most cost-effective solution is the pro lite model which is roughly $50 a month. However, this selection lacks some of the advanced features of the pro basic and pro plus plans which run about $70 and $90 a month respectively. 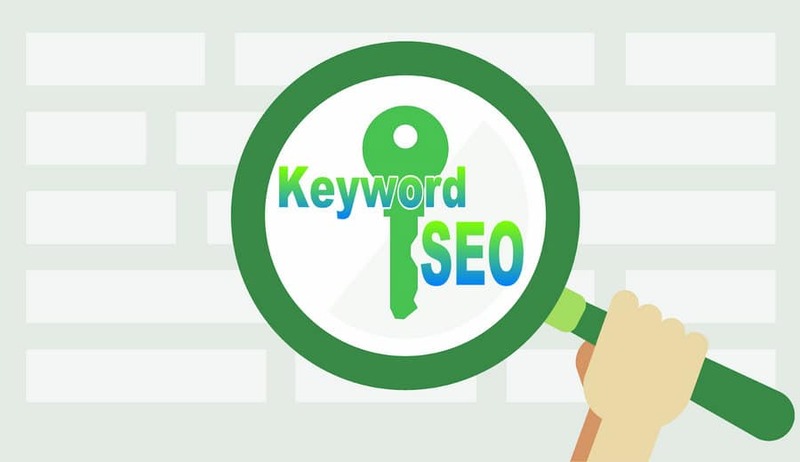 These larger plans will give users the ability to double their keywords as compared to the free version of Keyword Tool. Novice users who are just getting a feel for SEO should take advantage of the free service and work their way up to one of the paid subscription models as their workload increases. We think that Keyword Tool is the best keyword research and planning tool available to SEO marketers, and it’s the best keyword generation tool that we have reviewed. Although it lacks some of the other bells and whistles that our highest-ranking tools provide, it is an excellent tool to add to a marketer’s online toolbelt. Some of their highest-profile clients include Adobe, Microsoft, Barclays, and Philips. If these industry giants entrust their SEO keyword research and planning efforts to Keyword Tool, then you should experiment with their software too. Number six on our list of top ten SEO tools is Keyword Finder. This keyword research and planning tool is a bare bones option for marketers who don’t need any extra frills. KWFinder is a paid, but cost-effective alternative option for SEO marketers who need a keyword research and planning tool. Because it lacks the advanced features of some of the competitors, KWFinder has come in at number nine of our list of top ten SEO marketing tools. This easy to use keyword research tool is a great option for marketers who need to find the absolute best keywords for their marketing content. Very similar to some of the competitors on this list, this software has all the necessary features to help users build their online presence. One of the most popular features is the localized search results feature which allows users to target keywords and rank them based on geographic location. Picking keywords that are trending in a particular geographic area will allow marketers to reach more viewers and gain new followers and KWFinder makes this easy for customers by letting them track statistics such as CPC and PPC. KWFinder is included as one of four tools within the Mangools SEO package. This package provides users with four different SEO tools for the price of one. There are three available subscription models for customers to choose from. The Basic package is roughly $350 for the annual package and allows users up to 100 KW lookups per 24 hours, and 200 keyword suggestions per search. If you need a larger volume of searches and keywords, then consider either the Premium or the Agency packages which increase the allotted KW lookups and keyword suggestions per search. These packages vary in price but are roughly $500 and $1000 respectively. Another industry leading keyword research and tracking tool is SERPS. 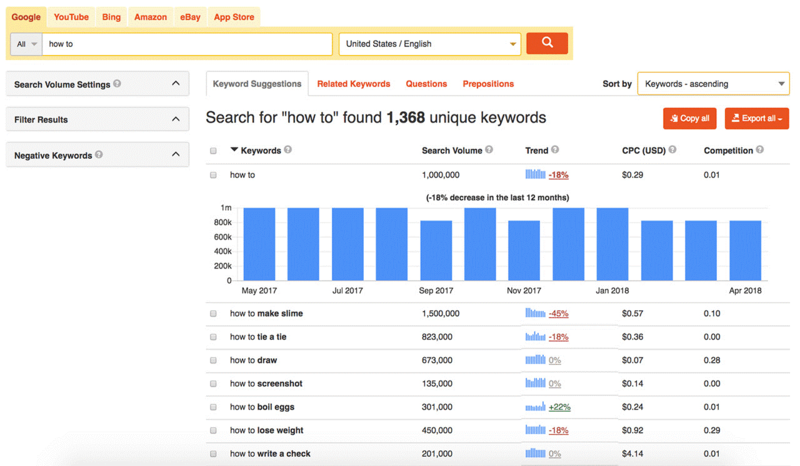 Coming in at number seven on of our list of the top ten keyword research tools for marketers, SERPS is a great addition to any digital marketer’s tool belt. SERPS provides useful features for users including keyword tagging, and a bulk rank checker that allows for up to 250 keywords at one time. This keyword tracking SEO tool also provides other useful features including analytical data visualization and reporting, but it doesn’t have enough features to be considered a truly all-in-one SEO solution for marketers such as MozPro or Ahrefs, and for that reason SERPS has landed in the number six spot on our list of top ten SEO tools. This innovative keyword research tool allows users to change their location and pull keyword rankings from individual regions around the world to see which keywords they need to use for each geographic region. This is a great feature which used to be available without SERPS, but Google has since removed that free functionality so users praise SERPS for its advanced geographic location changing features. Marketers and entrepreneurs who want to monitor their search presence can certainly count on SERPS. When you want to be able to track your organic traffic, the keyword tagging and tracking features offered by SERPS can be invaluable. There are three different subscription plans available for those interested in SERPS. The small business plan is ideal for users with only a few clients. This plan offers tracking for up to 300 different keywords, and functionality for up to five different domains. One limitation is that this plan only allows for one user though. Agencies who need functionality for more than one user should look at the agency plan or the enterprise plan. These larger plans allow for anywhere from 1,000 keywords to 25,000+ keywords. These more expensive solutions provide advanced features that the free and small business plan do not have such as white-label reporting and even dedicated account managers. SERPS is a great keyword research and planning tool for marketers who want to grow their online search presence. Depending on your needs, SERPS offers both free and paid tools for their users. The features and tools offered by SERPS are high-quality and backed by constant support and updates to improve the user experience. However, this tool lacks some of the advanced capabilities that some other high-ranking tools provide for their users. Regardless, SERPS should not be overlooked and is trusted by many industry professionals as one of the leading keyword research and tracking tools. Similar to many other tools on our top ten list, Raven Tools provides users with excellent link building, site auditing, and keyword rank tracking capabilities. Although Raven Tools boasts numerous features, we declined to see it as an all-in-one SEO tool for marketers. 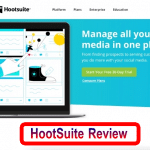 But, combined with other tools, Raven Tools can be a great addition to digital marketer’s toolboxes and has landed the number eight spot on our list. The reason that Raven Tools fell towards the bottom of our top ten list, is because of its relatively steep price tag. 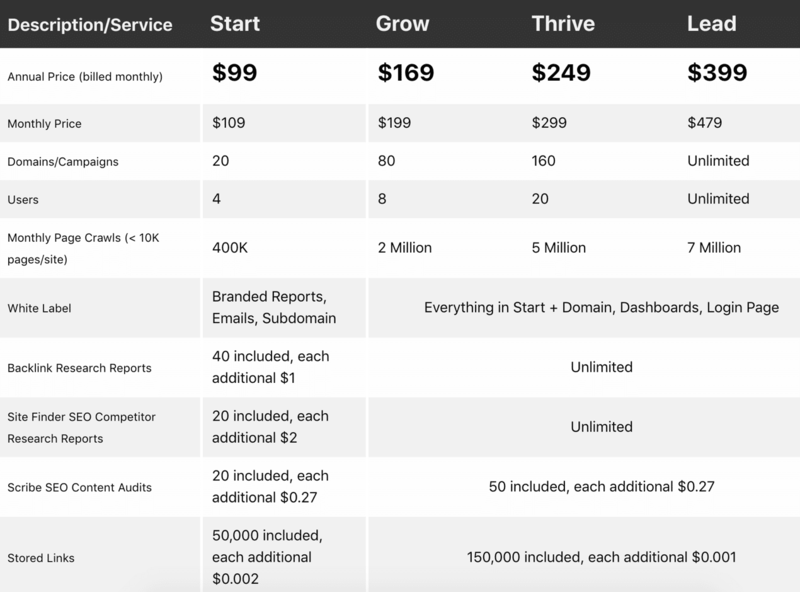 There are four different subscription models available for users, and they range in price and available features. The starting package is roughly $100 a month and allows users to perform up to 400K site crawls and monitor up to 20 different domains or marketing campaigns. The more expensive plans can facilitate users and agencies with larger needs. The Grow, and Thrive, packages are great options for users who need to handle more domains, campaigns, and perform more searches. These more expensive programs allow for additional users as well as unlimited, customized white label branded reports. This is an attractive option for users to want to maintain a professional appearance across their reports, dashboards, and emails. Raven Tools is very similar to some of the other SEO tools on our list, but we believe that it provides users with some of the best link building and competitor tracking information on the market. Raven Tools is an excellent option for marketers, but it lacks some of the innovative features offered by competitors, and for that reason it has landed at number eight on our top ten list of SEO tools. Marketers who need help with their link building should consider the services offered by Majestic SEO. This digital marketing tool made our list as one of the best backlink auditing tools available to online marketers. This bare bones service doesn’t have the added functionalities such as keyword research and planning like some of the all-in-one SEO marketing tools, but it does its primary job very well. Majestic SEO provides its users with a clean and easy to navigate user interface that shows all their important metrics in one location. The domain dashboard shows important statistics such as external backlinks, referring domains, redirects, as well as fresh and historic visitors. The advanced metrics that power Majestic SEO are essential for SEO marketers who want to grow their organic traffic. Monitoring external backlinks can be very time-consuming for many online and digital marketers. However, thanks to the Majestic SEO tool this has never been easier. This innovative software provides a backlink history feature that shows exactly how many backlinks have been reviewed on a daily basis. This is an important feature for users who want to generate insights based on their backlink building and external hyperlinks. Last but certainly not least on our top ten list of keyword research tools is the Google AdWords Keyword Planner. Developed by the innovative thinkers over at Google, this tool is provided within the Google AdWords software package. Google AdWords is an online advertising service that allows advertisers to find and select PPC advertising opportunities for their campaigns. This is a popular tool for online advertisers because there are no contracts, no minimum spending requirements, and the service is free to use, advertisers only pay per click. The Keyword Planner feature is a great option for users looking to track and generate the most popular and effective keywords for online SEO marketing efforts. AdWords Keyword Planner works flawlessly and is easy to use even for novice marketers. The reason that it is not higher on our list is because it lacks some of the more advanced features of some competitor’s tools. 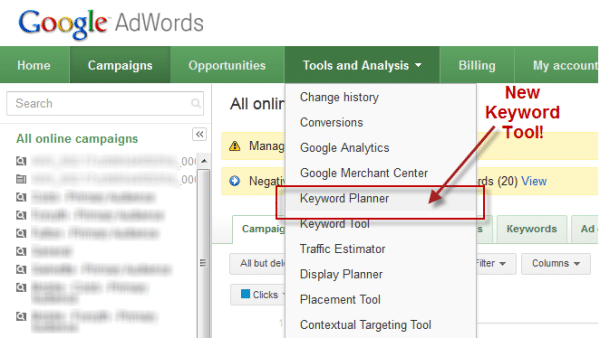 One of AdWords most popular features included in the Keyword Planner is the ability to track searches based on country. This country specific searching allows marketers to isolate keywords and generate their next campaigns’ keywords based on geographic region. 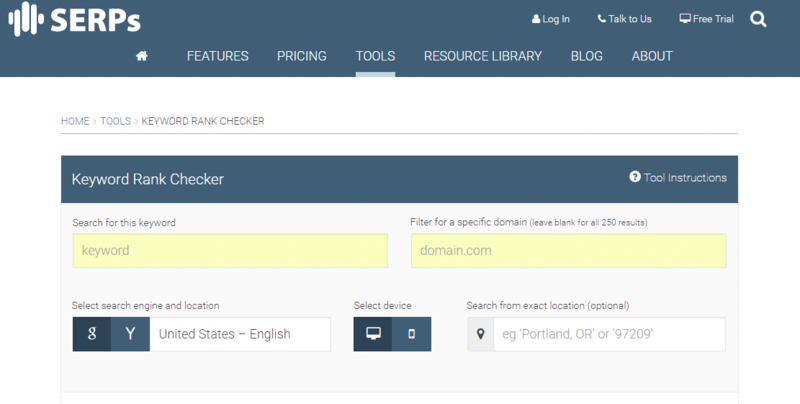 This ensures users search results will be keyed directly for user’s region. Various keywords do better in certain geographic regions and AdWords Keyword planner tools lets users optimize their campaigns for these geographic keyword niches’. It can often be difficult to find the right keyword planning tool that works for you and your business. There are so many tools out there it’s often hard to select the right ones to fill your own specific needs. But, after reading this informative guide you should have an expert handle on what keyword research tools you should test out for yourself. This guide was a list of the ten best keyword planning tools available to the public and included important information regarding product reputability as well as first-hand user experience reviews and images. If you are an online marketer and you want to push your webpage to the top of popular search engine results, then you need to use the keyword research and planning tools listed in this guide. Taking advantage of these SEO tools can help skyrocket your pages to the top. If you follow everything you learned after reading the guide, then you are closer than ever before to generating tons of wholesome organic online traffic!